Member of the Union of designers of Russia. 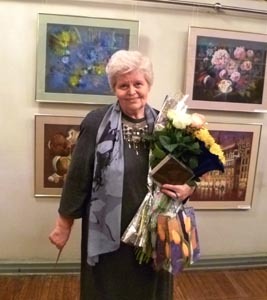 Valentina Ioffe 23 years taught on chair of design of the Ural State Academy of architecture and Arts (USAAA). The designer with the 40-year-old experience. The participant of the 11 international exhibitions on design in Moscow, Leipzig, Bombay, Athenes, Paris, Vancouver, Helsinki, Stuttgart. The participant of the 24 art projects, including 14 personal exhibitions. Valentina Ioffe's works are in private collections of Russia, USA, Canada, Germany, Israel, France and Czech republic. 2010 г. – Personal exhibition "Northern prospectus of Europe". Ekaterinburg, Russia. 2009 г. – "Spring revue". Gallery "Shlem". Ekaterinburg, Russia. 2009 г. – An exhibition in the Union of architects. Ekaterinburg, Russia. 2008 г. – "Anniversary" an architecture Museum. Ekaterinburg, Russia. 2007 г. – "The blue violin". Gallery "Egida" Ekaterinburg, Russia. 2006 г. – Personal exhibition of graphic art. Museum of architecture, Ekaterinburg, Russia. 2005 г. – Personal exhibition of graphic art. Museum of architecture, Ekaterinburg, Russia.